The leopard inside the Cooperative building and one of the injured. At least four persons, including a monk, were injured at Namsai town, the district headquarters of Namsai district in Arunachal Pradesh on Wednesday when a leopard on the loose wandered into the premises of the Cooperative Department’s building. However, a wildlife team from Miao rescued the leopard which was also attacked by the onlookers, took it to Assam’s Kaziranga National Park in the evening on Wednesday. According to media reports, the animal had been wandering in the area since around 7 in the morning creating a panic-like situation in the township. 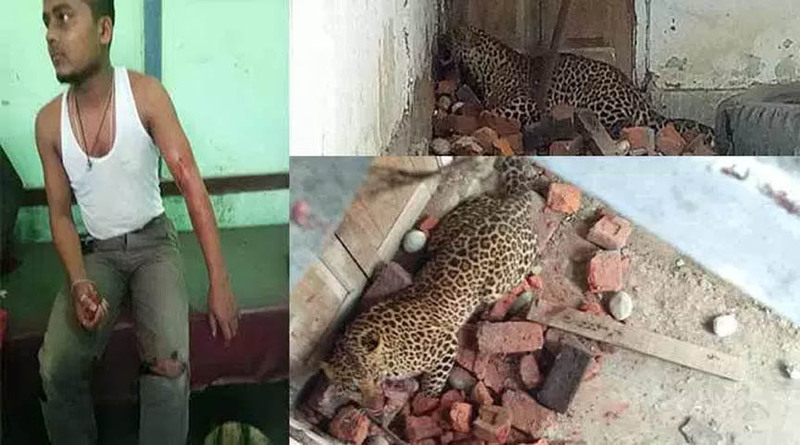 Sources informed that the leopard was locked inside a room of the Cooperative building which had been further locked from outside until the wildlife team from Miao arrived. The situation was handled by the police and Namsai district administration. The wildlife team had to tranquilise the leopard to sedate the animal before boarding it into the vehicle to be shifted to Kaziranga National Park. As per media reports, the monk, injured along with three other persons in the leopard’s attack, is from Mahabodhi Diyun. The monk, who was critically injured, has been referred to Assam for further and better treatment. Meanwhile, Namsai Divisional Forest Officer (DFO) T Mize reportedly has assured of extending compensation to the people who were injured in the incident.